From the Foreword by Professor Tony Attwood, Minds and Hearts Clinic, Brisbane, Australia. Stephen Shore, Ed.D., Assistant Professor of Special Education, Adelphi University, internationally renowned author, consultant, and presenter, and person on the autism spectrum. Many AS men are totally confused and bewildered by women and relationships and find it hard to know what to do, what to say and how to get it right. For these men, understanding the emotional side to relationships and women’s needs can be a complete mystery and they often get it disastrously wrong. This practical handbook provides the answers to Asperger men’s most frequently asked questions about women, dating and relationships, helping them to understand the way relationships work and increasing their confidence and ability to have successful relationships. 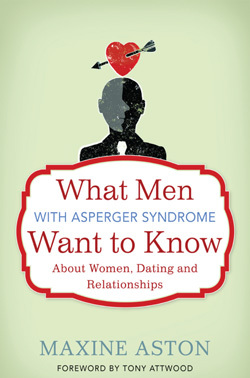 This comprehensive handbook is essential reading for men with Asperger Syndrome (and their partners). It will also be of immeasurable use to counsellors and other professionals working with such individuals. Maxine Aston is a qualified counsellor and supervisor and presents Asperger Syndrome awareness workshops to counsellors and professionals who may encounter clients affected by AS. She also runs workshops and support groups for partners and parents that live with a person with AS. Maxine has an MSc in Health Psychology and is the author of Aspergers in Love and The Asperger Couple’s Workbook, both also published by Jessica Kingsley Publishers. She is a regular speaker at National andInternational ASD conferences, and lives in Coventry, England.